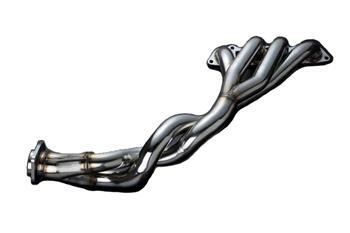 HKS Exhaust technology, which is know-how of long time development, targets to pull out 100% engine performance with the exhaust manifold. A lot of different approach were tried for each vehicle to keep performance for middle rpm range and to improve horsepower at high RPM. When strong vacuum is created, to the contrary, there will also be strong pressure. Cylinder pipes are connected with Bypass Pipe to reduce pressure as minimum as possible. Rhythm of “Pressure” and “Vacuum” inside manifold is controlled. Besides, number of bypass pipe, positions are designed to optimize for each engine characteristics. It enables to reduce pressure without change of vacuum. Therefore, there is no drop of torque as shown in the graph below. The engine will have Inertia Exhaust Gas Efficiency (Efficiency to increase horsepower of NA engine) and flat torque characteristics, which enables easy drivability. HKS selected 4-2-1 junction design that has best result for street use from study of various data about a lot of engine characteristics and exhaust gas pulse. 4-1 Junction type has shorter length to the junction part and it is better for competition purpose that require performance only at high rpm range. But it has too less torque at low rpm range for street driving. HKS’ Straight Junction Design accelerates exhaust gas with exhaust gas pressure and it pulls out combustion gas. Exhaust gas efficiency is improved with the design.